Dragon Age Inquisition (Xbox One) review. Firstly, I'll need to get this out of my system. There, the inquisition as a musical…. Thedas doesn't have it very good at all, does it? The fact is, that while much of the storyline is about the division between magic wielding Outcast mages and war-mongering Red Templars, those turn out to be the least of your worries. In your travels, you come across Giants, Trolls, demons and yes, even dragons, all who have a serious bone to pick with you and your party. Your party of four struggles with these and more in a semi-open sandbox environment across huge expanses. You are able to acquire a mount to help cut the distances, but with much of the open air map populated by all manner of creature out to do you harm on sight, the mount seems rather useless in most cases. On top of this, you will find yourself often in caves, buildings and other enclosed spaces, using your wits to survive scores of mobs that just don't like your face. Of course you can't manage just by wits alone. You need arms, clothing, equipment, etc, etc; this is where the War Table comes into play. The War Table is the nexus of the DAI experience where you can find out about new quests or finish ones already in progress, send your forces out to gather supplies, or unlock new locations. It's also where you manage your perks which are broken up into several cateogories that will effect your martial strength, abilities, or passive skills depending on which ones you choose. Where Dragon Age Inquisition shines particularly brightly is…well, more or else everywhere. You can see how hard Bioware has worked to try and make this game a fusion of DA Origins and DA2 and the resulting product is fantastic. The farther you go in the game, the more there is to see, and what makes it even better is that there is little to none of that feeling you get with other sandbox type games when you're having fun, but you have this niggling doubt at the back of your mind about how much this really helps the campaign mission. In Dragon Age Inquisition even the sidequests help in furthering your gaming experience due to the Influence meter which allows you gain perks which can improve your gameplay experience. On top of that, the game is beautiful: many times I've just stopped my party moving about so I could admire the view, an action that was often preceeded by me saying "wow". … As In WOW that 30 foot tall troll is about to STOMP ON ME?!! What else was impressive about the game was the amount of content that you find in the game, but even more so was how it doesn't feel forced or rushed in it's placement. Each time you enter a new zone, for example, the officer at the camp will give you a variety of quests to complete which usually involve gathering materials for geological surverys or for providing specialized equipment for your troops. Then there's also the side quests which can come from a variety of different sources; talk to the singer at the bar and boom, you have a new War Table quest. Stop by to look in on one of your party members and she'll tell you about a lead she wants your help with. The best part of all is that all these quests do benefit you in some way, either with influence, gold, perks, or just a laugh from reading the quest description. When's the last time you saw a rhyming quest description? How about exploding enemies with a giant spoon? Speaking of War Table quests, these are faction (Influence) quests that at first may seem frivilous, but ignore them at your own peril. Influence helps gain Inquisition perks, essentially passive abilities that come in quite handy in later gameplay. These later quests and boss can be extremely hazardous if one have not built up these perks. In order to gain these Influence points, you will need to complete missions. More important missions will gain you more influence than smaller missions. OR you can farm gold and buy influence tomes from the merchant in Skyhold. This latter method can be done up to 10 times per tome. 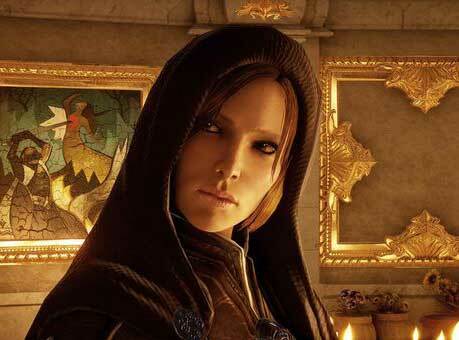 Welcome back Sister Leliana as an advisor at your war table. In pursuit of these missions and battles, you are accompanied by 3 stalwart companions, each of which has different characteristics and abilities. The composition of the group can change as you met others that you recruit as companions. For a brief, yet helpful guide to the companions, check out the companions page at http://guides.gamepressure.com/dragonageiii/guide.asp?ID=27752 . So let's talk about the elephant in the room; does the game have any flaws? Well, yes, but they are forunately minor ones. The graphics engine can often be twitchy, with aspects of the landscape popping up as you approach or wavering in and out of sight when you spur your horse to a gallop. Sometimes quests bug out, but do resolve themselves once you go away and come back. Locations can often be not as finally polished as they could be…once, after picking up a sidequest to collect scattered books in my castle, I found one floating several feet in the air for no apparent reason. However, these are just tiny errors in what is a finely crafted and beautiful creation. If you like RPGs even a little bit than you should buy this game without hesitation.